Nestled into private manicured grounds, this executive 4.1 bedroom home in desirable Glen Abbey is located just a short walk to all amenities. The home features a generous floor plan with hardwood and ceramic tile flooring throughout the first two floors, and neutral berber carpeting and laminate hardwood in the lower level. Upon entering through the foyer, the home opens to a large formal living room and dining room featuring hardwood flooring, crown molding and bay windows offering an abundance of natural light. The oversized gourmet eat-in kitchen features new granite counters, updated cabinet soft close doors, porcelain backsplash, matching stainless steel appliances, a computer nook and plenty of pot lights. Walk out from the kitchen to a ravine-like oasis with wooden deck and pergola, interlocking brick patio, hot tub and cabana. The spacious family room with hardwood floors and gas fireplace, main floor laundry with garage access, and the updated powder room complete the first level. The second floor master bedroom features jatoba hardwood flooring, his and hers reach in closets, an additional full walk-in closet, and a five piece ensuite bath with soaker tub. The remaining three bedrooms are generous in size and feature hardwood flooring, while the four piece main bath completes the upper level. The professionally finished lower level features neutral berber carpeting, laminate hardwood, halogen pot lights, theatre room with built-in projector including screen and surround sound, gas fireplace, games area, storage room and fifth bedroom with three piece ensuite bath. Central air, California shutters, brushed nickel hardware and double car garage with new doors complete this gorgeous turnkey family home. 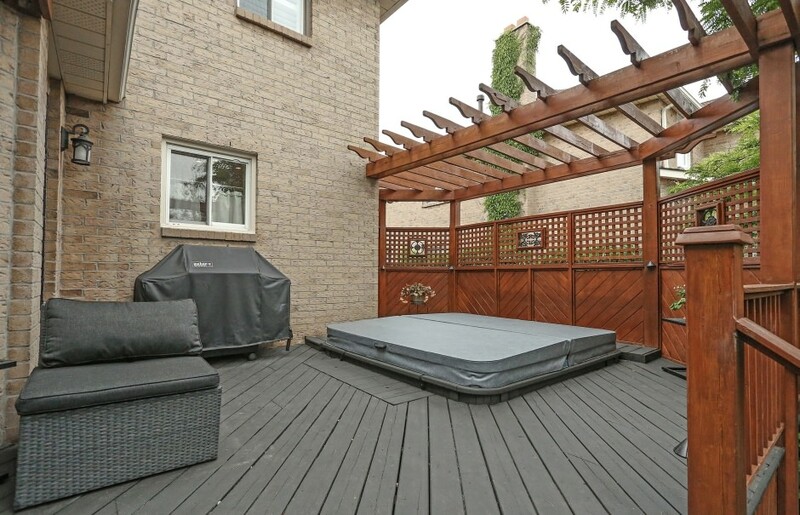 Conveniently located within easy walking distance to nearby nature trails, parks, shopping, rec centre, library, sport facilities, GO transit and some of Oakville’s best schools.